President Hage Geingob yesterday told a French company that partnered with the Namibia Development Corporation on establishing the Peugeot assembly plant at Walvis Bay to share the profits. The company, PSA Group, and the development corporation opened a N$190 million Peugeot Opel assembly factory at Walvis Bay, which is expected to assemble 5 000 cars by 2020. Geingob inaugurated the plant yesterday, and said: "You enjoy the system and share the profit. That is the bottom line and social responsibility." The president added that the plant was a significant development for Namibia in that it fits in with the country's development goals and potential, and so boosts local enterprise development in a time when Namibia still faces challenges of poverty eradication and employment-creation. According to Geingob, the development of an automotive industry was part of Namibia's Growth-At-Home strategy, which emphasises the importance of commodity-based industrialisation by strengthening local and national value chains. Walvis Bay was a strategic location, with the port being linked to southern Africa - including several landlocked countries - via a modern corridor system. Through this link, Walvis Bay gives Peugeot access to 330 million people, he noted. The plant began operations last month, and has since assembled 15 vehicles, comprising five Peugeot 3008s, five Peugeot 5008s and five Opel Grandland X models. The Namibian understands that 55 components of each vehicle were exported to Namibia for assembly before being meticulously tested for the local and international markets. It is also understood that the Walvis Bay factory is expected to expand over the next few years to handle a broader set of components for each vehicle. The assembly plant, which is situated in the harbour town's new industrial area, employs 50 people at various levels of the assembly line. According to the vice president of Peugeot Namibia, Emre Karaer, the French multi-national auto manufacturer the PSA Group, produced 2,2 million vehicles during the last financial year. 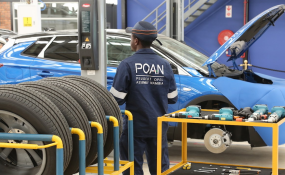 The assembly plant is now part of a half-a-trillion Namibia dollar revenue corporation, with PSA Group being one of the largest vehicle manufacturers in the world. The assembly plant is a joint venture between the National Development Corporation and PSA. The French ambassador to Namibia, Claire Bodonyi, said France has a long relationship with Namibia, and considers Namibia as a "lion" when it comes to its Southern African Development Community partners. She said PSA chose Namibia because of the port of Walvis Bay and its link to the rest of SADC. This new development will pave the way for agreements between the port of Walvis Bay and key ports in France, she added. "This is a valuable trade partnership between France, which has the European Union, and Namibia, which has SADC. It is a win-win situation," she said.